Wednesday, April 17, 2019 - This lady had a perfect response to a friend who wanted to know why she’s still single. 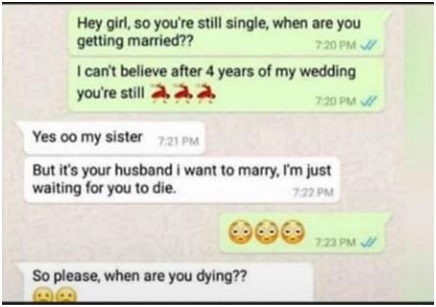 From the screenshot going viral on social media, the lady’s friend has been married for four years and wanted to know what’s happening with her friend who’s still single. She clearly did not take her insensitive probing lightly if her response is anything to go by. Let this be a warning to those men and women with this annoying habit. Remember, marriage is not an achievement. Check out the conversation below.